When I pick up a release from Woodcut or Hammer of Hate I know what to expect. 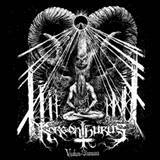 Finnish black metal at its finest, and Korgonthurus Vuohen Siunaus delivers on cue, in line with expectations and its members legacy. The band is powered up by Kryth on drums (Musta Kappeli) and well-respected Corvus on vocals and one of Korgonthurus’ three (!) guitars. Corvus has been the voice of Horna for the better part of previous decade, and perhaps is their finest vocalist. To say Korgonthurus play noisy and raw is to say nothing. The trio of guitars here are electric, seething with 1,000V, weaving grating tremolo leads around muscular riffs. Grating is also an epithet that describes Korgonthurus mildly, you are being put hands and face down on the sharpest possible surface. Basically, Korgonthurus plays at the edge of audial tolerance … yet, if you are prepared, and had prior experience with the genre, Korgonthurus is actually sophisticated, Vuohen Siunaus receiving careful and deliberate treatment from the hands of experienced sound masters. This is no random cacophony, but instead textured guitar framework sitting atop the foundation of powerful drums led by one anguished voice. There are some tracks on the album which is pure untamed rage (I.K.P.N., Inho). To listen to the opener Kaaos is to peer inside of Hell and see the Beast itself. Yet as much as that Beast can rage and battle, from midway in of Puhdistuksen tulet and the title track there is a stark realization that the creature is actually wounded, it can and does grieve inside, to the point of being melancholically suicidal. Puhdistuksen tulet goes through slight clearing, with multiple voices being heard, but it is the last two tracks Ihmisyyden rauinioilla and L.U.X., which vault Vuohen Siunaus all the way to the top. It is with those compositions, when Corvus is singing especially depraved, when the melody is absolutely dominating, that Korgonthurus makes rightful claims to stand next to the best in the genre. I absolutely don’t care L.U.X. is as long as it is. There is nothing to be left out, and the inner torment, the sense of finality, is overwhelming. Combining dark melodicism, strong riffery and incredible atmospheres Korgonthurus borrows from many who came before them (Horna, Behexen, Sargeist) and yet comes up with their own amalgam elevating themselves above the genre’s second echelon (Calvarium, Anguished, Forgjord, Nattfog). Being that the band was on hold for several years, and there was a 7 year break between Vuohen Siunaus and its predecessor Marras (which I have not heard), it was well worth the wait.